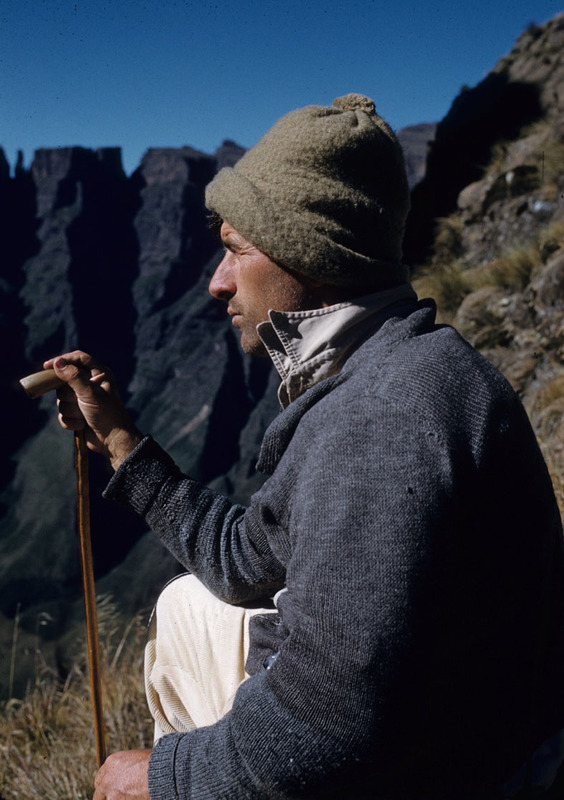 Ulrich Nänni was a devoted Swiss-South African ecologist whose meticulous collection of landscape photographs was driven by his love of the Drakensberg mountains. Ulrich Wolfgang Nänni was born in Switzerland on 28 May 1924, and immigrated to South Africa with his family, while still a baby. His father, Jakob Nänni, was the founder of the East London aquarium , where one of his great achievements was breeding Australian seahorses for many generations. He was also the man responsible for informing Professor Smith of Rhodes University of the discovery of the first coelacanth, thought to have become extinct 70 million years ago. Ulrich matriculated from De La Salle College in East London in 1942, and served in the South African Navy during World War II. He went on to study Forestry at Stellenbosch University, graduating with a BSc in 1949. He joined the then Forestry Department, starting his career at Jonkershoek and was transferred to Cathedral Peak in the Drakensberg mountains in 1952 to take charge of the summer rainfall hydrological research station there. In his 11 years there, he initiated major catchment research projects at the centre, and also at Mokubolaan in what was then the Eastern Transvaal, becoming an authority in this field. Apart from his profession as a forester, he was an expert in the field of hydrology, and a passionate conservationist who was keenly involved in protecting the coastal dune area of northern Zululand. In addition to his scientific publications on forest hydrology, he also published on various aspects of agriculture, conservation, forestry and landscape architecture. ‘He was a man of great personal charm and tact and a persuasive debater, and his wise counsel and knowledge made him a valuable member of the numerous land use, hydrological and conservation committees on which he served,’ reads his obituary published in Forestry News, the official newsletter of the Directorate of Forestry, Department of Environmental Affairs, Pretoria, June 1983. In 1963, he was transferred to Pretoria, but ‘life in the big city did not appeal to Mr Nänni’, and in 1969 he left the service of the Department of Forestry for the rural surroundings of Howick, to be nearer to his beloved Drakensberg mountains. Shortly after moving to Howick he joined the Department of Agriculture Technical Services in Pietermaritzburg, and in 1972, was appointed to the new Land-use Unit at the Cedara College of Agriculture. He made numerous innovations at the College and, in 1981, was appointed Principal, a unique achievement for a Forestry graduate with no formal agricultural training. ‘He filled his new post with distinction and his attributes of compassion and understanding of the needs and aspirations of young people made him eminently suited to the post. He commanded the respect and loyalty of all with whom he came into contact,’ reads his obituary. Nänni was a keen hiker and mountaineer, and later enthusiastically took up hang gliding. He died of a heart attack in April 1983 while climbing Cleft Peak with the intention of hang-gliding off the summit. A year later his son, Greg, undertook the flight in his memory, easily reaching the intended landing site. 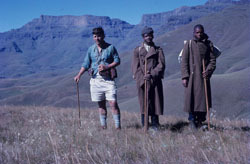 Cleft Peak is in the Cathedral Peak area of the KwaZulu-Natal Drakensberg, ‘the mountains which he knew and loved so well and for the conservation of which he did so much’.